How is this possible? - one would ask. Well, it takes 25,800 years (one Platonic year) for the Earth’s axis to complete one clockwise circle. This causes the line of the North Pole to scribe a circle, thus our North Pole star changes with the time. The current North Pole star is Polaris 勾陳一, the next one will be Al Deramin (around 7500 A.D.). 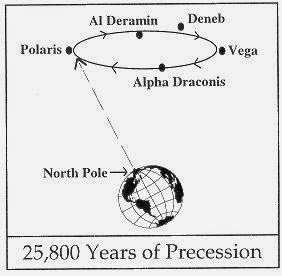 Then, as the precession continues, Deneb 天津四, Vega 织女星, Thuban (Alpha Dragonis) 右樞 and Kochab 北極二 will also become North Pole stars, like they have been already thousands of years ago. 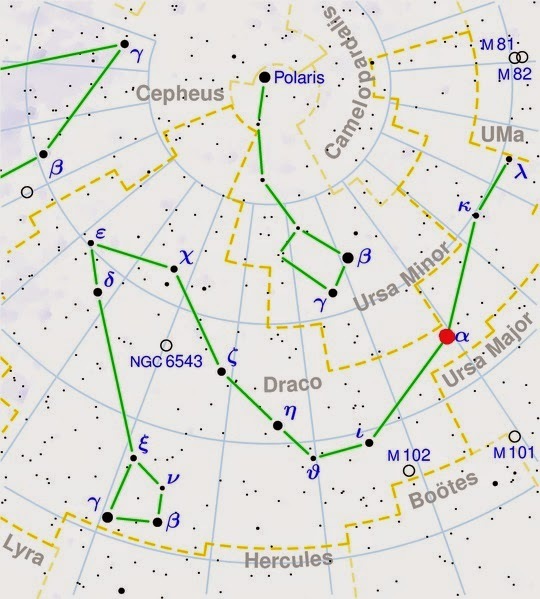 Celestial Map showing the constellation Draco. Image credit: Torsten Bronger. 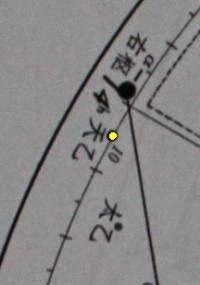 In Chinese astronomy Thuban star is known as 右樞 (You Shu "Right Pivot") and it is located at Zi Wei Right Enclosure (Zi Wei You Heng 紫微右垣). Just next to it is the Celestial Great One 天乙星 (Nobleman star 天乙贵人 Tian Yi Gui Ren). In modern astronomy, both Thuban and Nobleman star (天乙贵人) are part of the constellation Draco. Thuban is Alpha Dragonis; Nobleman star is 10 Dragonis (also named CU Dragonis). 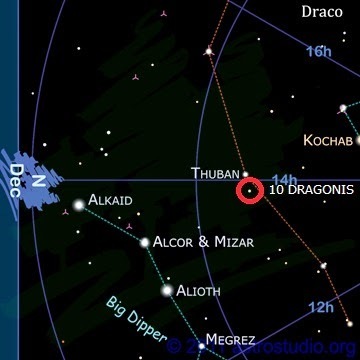 "Indeed, there were not one, but TWO pole stars, though the other one, fifth magnitude (4.64) 10 Draconis, which lies just 1.4 degrees to the west of Thuban, is never mentioned alongside its far better known neighbor. And too bad, as of the two it may be the more interesting. If not, it certainly is the more colorful, a red giant that through binoculars or a wide field telescope contrasts very nicely with white Thuban... From a distance of 390 light years 10 Draconis shines with the light of 840 Suns, though the great majority of the radiation lies in the invisible infrared part of the spectrum." This is so amazing to have had one of the most auspicious stars as the North Pole star, powerfully shining with the light of 840 suns! Even if its radiation is invisible, the beneficial effect of the Nobleman (Celestial Great One) star still reaches all of us.